We make smaller entrance and name signs for B&Bs, lodges, and inns. These typically have sizes of 3 ft x 3 ft and smaller, in contrast to the monument signs above, which are typically 6 ft x 8 ft or larger. The smaller signs may be mounted on a building wall, an entrance gate or wall, hanging from a scroll bar mounted on a post, or double post-and-panel mounted. 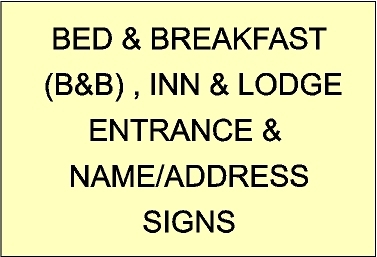 Our B&B and inn signs are made out of either HDU or wood. If 3D carving is required, and the sign is to be painted (rather than stained or clearcoated as for wood), we use HDU because of its longer life and lower maintenance.Our B&B signs are very elegant, with intricate carving and lots of color. effective than small arrow signs, These generally are classified in Product Line 2 (carved HDU) or Product Line 3 (wood). To see over 150 other EPS dimensional monument signs, premium 3-D or 2.5-D carved, sandblasted, ot engraved, High-Density-Urethane (HDU) or wood post-and-panel entrance signs for hotel, motels, inns , and B&B's, , please click on "Return to List" below right.